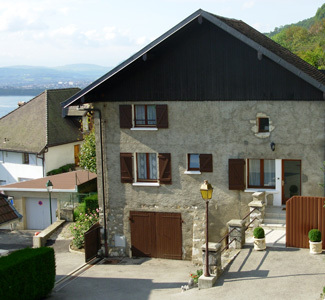 House rental 4 seasons in Veyrier-du-Lac - "Les Weitchiis"
On the slope of the Mount Veyrier, renovated house on 2 floors, very quiet, overlooking the sunny shore of Lake Annecy. Rated three stars *** new standard. Good comfort : dishwasher, washing machine, digital color television, free WIFI. •	Private parking and courtyard shared with the owner, with an electric gate.